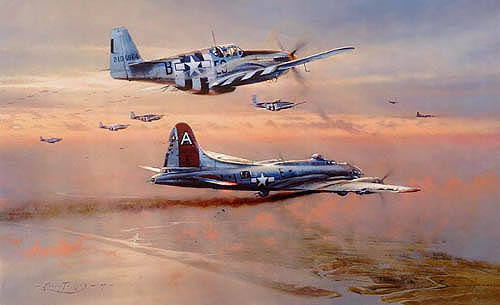 Badly marked by Focke-Wulf 190’s the B-17 The Peacemaker of the 91st Bomb Group limps towards the sanctuary of the English coast escorted by P-51B Mustangs of the 361st Fighter Group. To keep her flying the crew are jettisoning everything that they can. The Peacemaker made it back to Bassingbourne that day; eight others did not. by the sheer beauty of each canvas"